Before turning to a keto lifestyle, I would regularly get the 20-piece chicken nuggets from Mcdonald’s. There’s just something about breaded chicken in bite size pieces that you can dunk into sauce… You know exactly what I’m talking about. It’s almost as if food in bite sized pieces makes it so that you’re not even eating anything. What calories?! Seriously though, name a nugget and I’ve either eaten it in surplus or would kill to try it! I’m even a huge fan of the Chik-fil-A chicken nuggets although I now refuse to ever order there (for personal reasons I’m sure you can pick up on). I had the protein and the base spice down, but the tough part would be the breading. We’ve tried many different breadings and had success with one in particular – pork rinds and parmesan. But, wouldn’t that defeat the purpose of using tofu? It was actually Matt who picked up on that! So we needed a breading that was 1) Not made of pork and 2) Would coat and stick to the tofu well enough, so that it wouldn’t fall off if we decided either to bake it or fry it in a pan. Almond flour seemed like the natural go-to so, without hesitation we began to make our breading mixture. A little of this, a little of that and within minutes we had our breading. Not as tough as I thought it would be! Egg wash is a must! Without the egg and heavy whipping cream (you can sub in half and half or milk) as a base wash the breading will not stick to the tofu! You want a generous coating of both to give you the real nugget feel. This part is something I’m sure we’ve all done before – dip the tofu in the wash and then toss it directly into the breading. It’s the same process you would even do for non-keto foods! Most importantly you want a single layer on the pan before you put it in the oven. This will ensure not only even cooking, but crisping of the nuggets. We even opted to hit it with the broil for a couple minutes at the end and recommend you do it too! It’s truly a simple recipe that works great on all occasions. Take them to a party, make them for a football game or pack them in your kids’ lunchbox! Once you try these you won’t miss your 20 piece from Mcdonald’s.. or maybe its just me who ate those on the regular ?! 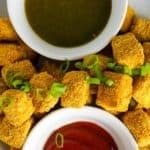 Cut tofu into 1 inch x 1 inch pieces and toss in salt and curry powder. Splitting into small batches, dip the tofu into the egg wash coating generously. Immediately transfer to the breading mixture and shake coating all over the tofu leaving no area exposed. Place on a greased oven tray. Repeat with the rest of the tofu layering into a single layer on the oven tray. Place tray into 425 degree oven for 22 minutes.